EVM used in the 2019 India general elections – Besides every candidate's name and party symbol on the Electronic Voting Machine (EVM), there is a blue button. Screenshot from YouTube Video by LatestLY. On April 14, 2019, the world’s largest democracy voted in an election for seats at the Lok Sabha, the Lower House of India's Parliament. This election is crucial as it will determine the identity of the governing political party, and ultimately of the Prime Minister of India. The 36 various Indian states and territories that make the Union of India are invited to vote in several phases, each entitled to a different number of seats based on their size. The ones voting in this first phase were Lok Sabha constituencies from Andhra Pradesh with 25 seats, Telangana with 17 seats, and Uttarakhand with 5 seats. 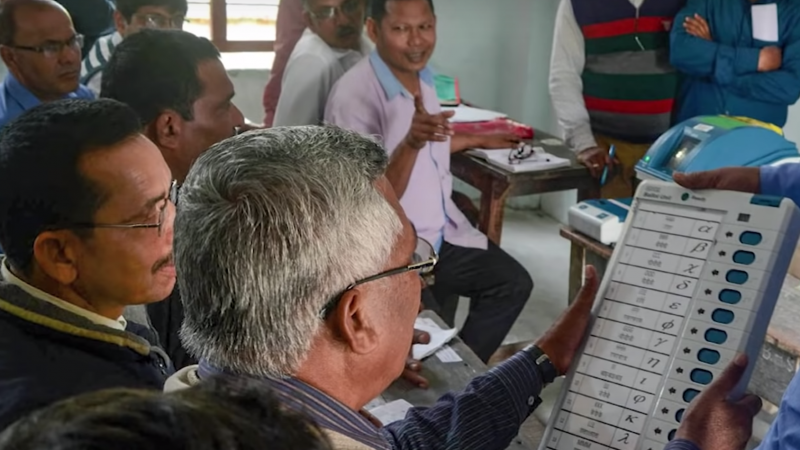 Arunachal Pradesh, Jammu and Kashmir and Meghalaya also entered this first phase of elections, with two constituency seats each being up for voting. Finally Manipur, Mizoram, Nagaland, Sikkim, Tripura, Chhattisgarh, Andaman and Nicobar and Lakshadweep voted for one seat each, while seven seats were available for Maharashtra. A total of 91 constituencies went into this first phase. Read: All you need to know about India's 2019 general elections. On the first day of the election, the voter turnout in some states was seen to be high, with Northeastern Tripura registering a maximum voter turnout of 81.8 percent for its one constituency. Jammu and Kashmir recorded a voter turnout of 54.4 percent for its two constituencies, 50 percent was recorded in Bihar for its four constituencies, Uttarakhand witnessed 57.8 percent, Telangana saw a turnout of 60 percent and Andhra Pradesh had a 66 percent of voter turnout. The key state of Uttar Pradesh with the highest constituency recorded a voter turnout of 64 percent. The election commission declared that barring a few incidents, the voting went on peacefully. There were however a few incidents that hampered with the citizens’ right to vote. Andhra Pradesh reported of a violent clash and faulty Electronic Voting Machines (EVM) that obstructed the entire election momentum and left 2 dead and 4 others injured. The two main political parties that clashed in Andhra Pradesh, were Telugu Desam Party and YSR Congress Party. The voting took a violent turn when the YSRC accused TDP of rigging the EVMs. As many voters reported faulty EVMs, both parties started the blame game. The situation escalated and led to clashes that were witnessed in Kotha Veerapuram and in T Sadum villages. In Veerapuram, police had to resort to lathi charge to disperse the mob, while additional police force was brought in to control the situation. The clash ended tragically: local political leaders Chinta Bhaskar Reddy from TDP and K Pulla Reddy of YSRC died succumbing to severe injuries. According to a report by New Indian express, an a online news site, a booth-level worker of YSRC also died in T Sadum village. Andhra Pradesh was not the only state that witnessed disruptions. Improvised explosive device (IED) explosives were detonated in the Gadchiroli district of Maharashtra. This area has a history of Naxal clashes and two IEDs were detonated, one on Wednesday which was a day prior to the voting, and on the day of the voting. On the day prior to the voting, the IED explosive was detonated when a polling party was visiting the polling booth with the Central Reserve Police Force (CRPF) providing security. A CRPF Jawan sustained injuries according to a report. On the day of election, another device was detonated about 150 metres from the polling booth where people were queuing up to vote. No casualties were reported. In Hyderabad, the capital of the centre-south Indian state of Telangana, many voters were turned down at the polling booths as their names were not to be found in the voting list. The voters felt deprived to exercise their right and were sent back. Some of them included executives from the corporate world such as Shobana Kamineni Vice Chairperson of Apollo Hospital, and RC Bhargava Chairman of Maruti Suzuki. Apart from those incidents, the voter turnout seemed to have set the momentum for the elections. West Bengal also reported the highest voter turnout with 81 percent. Andhra Pradesh had voting booths open till late due to faulty EVMs slowing down the process. Across all the constituencies, more than 50 percent of eligible voters cast their vote. Citizens of the country partook in various initiatives to encourage others to vote. Some took to Twitter to encourage more voters. In the state of Tamil Nadu, people even formed a human chain in order to encourage more voters to cast their vote. The next phase of election starts on April 18, to be followed by several others phases from April 23, April 29, May 6, May 12 and May 19, as India awaits to see who gets selected as the Prime Minister of India. The counting of the votes is to be done on May 23.